The Andhra Pradesh state is all set to host Punnami Orvakal, the first ever Full Moon Festival at Orvakal, 350kms away from Bengaluru in Orvakal Rock Garden at Kurnool in Andhra Pradesh. The location (20kms away from Kurnool the city served as the capital of Andhra State from 1953-1956) is picturesque. It will be a perfect occasion to bid summer in style as the moon will be at its fullest, brightest and dazzling. “The Andhra Pradesh Tourism welcomes Bangaloreans and people from Karnataka to be a part of this great and spectacular Festival to be held in a place that stood testimony for 3 Billion Years. It will be a never before experience for the select few participants,” added Mr. Shukla. “An air-conditioned well furnished tented accommodation with all modern comforts will be provided to visitors. We have procured 100 tents from the Rann of Kutch in Gujarat, the ones used in the Rann Utsav,” says Shukla informing that nearly 30 tents have already been booked. The tickets are priced at Rs. 15,000 (Platinum), Rs. 10,000 (Gold) and Rs. 5,000 (Silver). It includes food and accommodation for two days for four persons. Akshar The Band and Black Sheep will enthral guests with their live band performances. Besides these performances, Venetian Carnival, Mind Reader Mohit Rao and Illusion Artists shows will be held. The festival promises to be an exciting extravaganza with many live shows, Video Installations, Adventure engagements/activities, Multi-event venues & Grand Carnival Parade. Air-conditioned Breakout Tents, Mesmerising Arenas. For the ease of many corporate and cosmopolitan crowd, many fast food joints such as Subway, Dominos & much more will be made available. 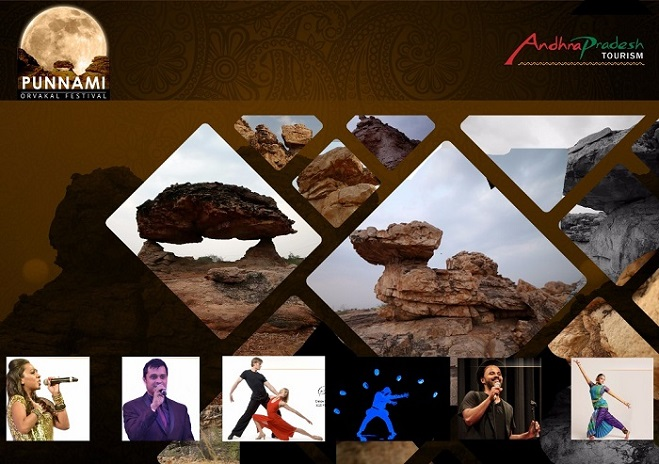 The nearby attractions to the festival include Ketavaram (20minutes drive), Belum Caves (1.2hours drive), Gandikota (2.4hours drive), Ahobilam (2hours drive), Mantrayalam (2.3hours drive) and Mahanandi (1.2 hours drive). Bookings for the festival can be made online through Book My Show, Mera Events.